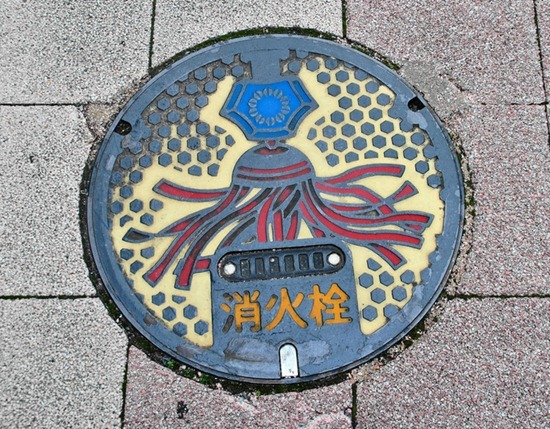 Jinnger spotted this Japanese manhole cover. Could this be the FSM? What’s the significance? this is a sign that the end of times is near. last night i heard a strange sound and saw flashing orange/yellow lights in my bedroom, the colour of the lights looked like the same sort of colour bolognese sauce. this is a sign that FSM was there out side in his physical form to try warn me. after seeing this picture it all makes sense i had a dream in which buildings where collapsing and the earth was being destroyed and guess what there was a japanese ninja turtle in it where would you find a japanese ninja turtle? maybe underneath a japanese man hole. we must repent our ways and give our souls and bodys to the all might FSM so we can be reborn as young meatballs in a bowl of spaghetti. my brothers we must stock up, buy as much spaghetti as you can because in the end of times that will show the almighty master who his loyal subjects are and we shall offer him spaghetti as a gift in order to be accepted. i also got a text today saying my credit would run out on the 28/5/17 thats in 3 days that means in three days he will come for us so be prepared brothers and remember to sing our prayers so that FSM can cleanse our souls for the day of the great spaghetti reheating. may my meatballs be with you all. Moses, can I have some of what you’ve been smoking?